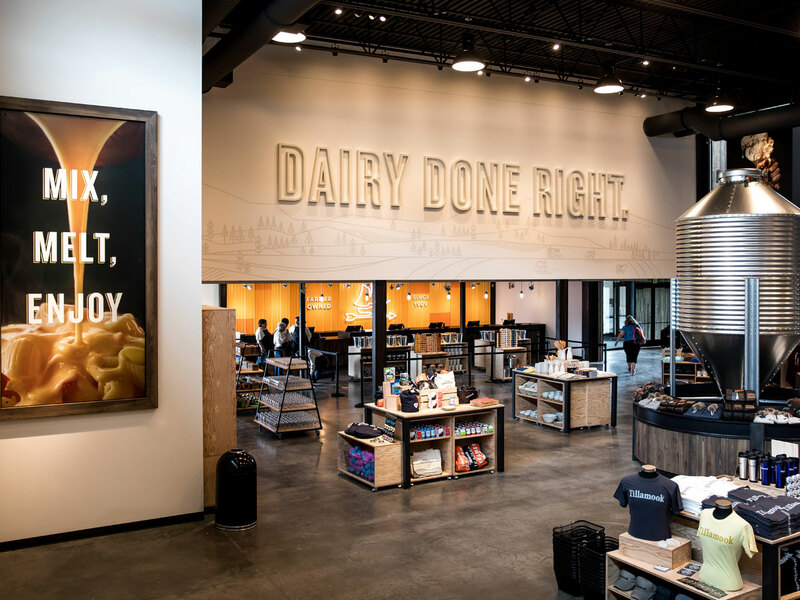 Out along the Oregon Coast, Tillamook Creamery recently debuted new digs, and they're spectacular. Two interesting things happened in Oregon quite recently, and one of them is that marijuana is entirely legal now. Legal as in, walk into your friendly neighborhood dispensary, flash your picture identification, and walk out with a bunch of weed, as casually as if you'd just dropped by the local coffee shop for a no-foam latte. 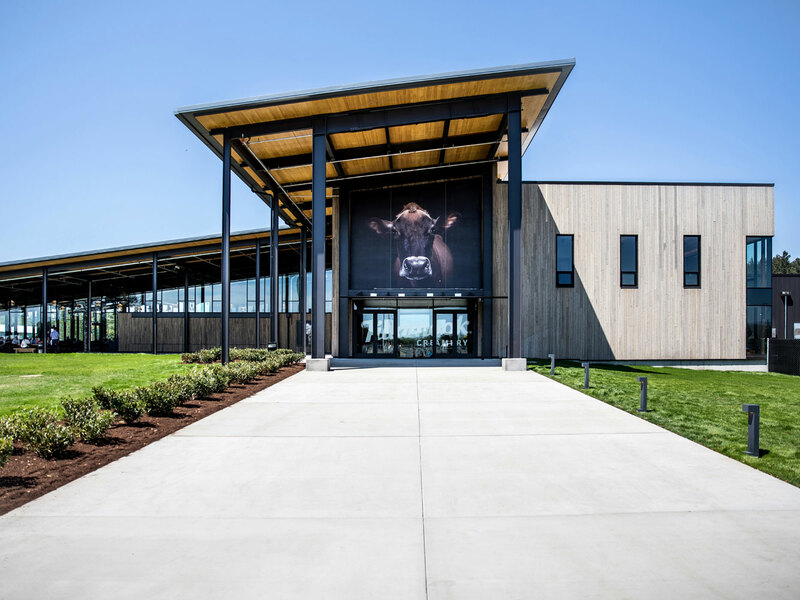 The other thing that happened is also quite important to Oregon's economy, at least to the economy of one important town in Oregon, and that was the grand opening of the absolutely giant, flat-out gorgeous new home of the Tillamook Creamery. One of the most visited tourist attractions in the Pacific Northwest, the production facility for one of the West Coast's best-known dairy brands receives roughly the same number of annual visitors as the Space Needle in Seattle, which is a lot of people—more than one million of them, annually. These two recent developments fit each other like a glove, really—just like always, the Creamery is a place to come learn how cheese is made, but it is mostly a place to come and eat yourself silly, choosing from a long list of very good options, from hearty portions of, say, beer and bacon macaroni and cheese, to leaning towers of Marionberry ice cream, perched on top of sugar cones. There is clam chowder, there are free cheese samples, plus a marketplace rammed full with good Oregon product, a lot of it highly edible and delicious. If for some reason you find yourself ravenous, and wanting to eat everything in sight, here is your idea of heaven. On the other hand, you have to get past that damn cow. The cow, the giant cow, 10 times larger than an actual cow, maybe two stories high or so, looking terrifyingly real, posed menacingly above the creamery's main entrance. 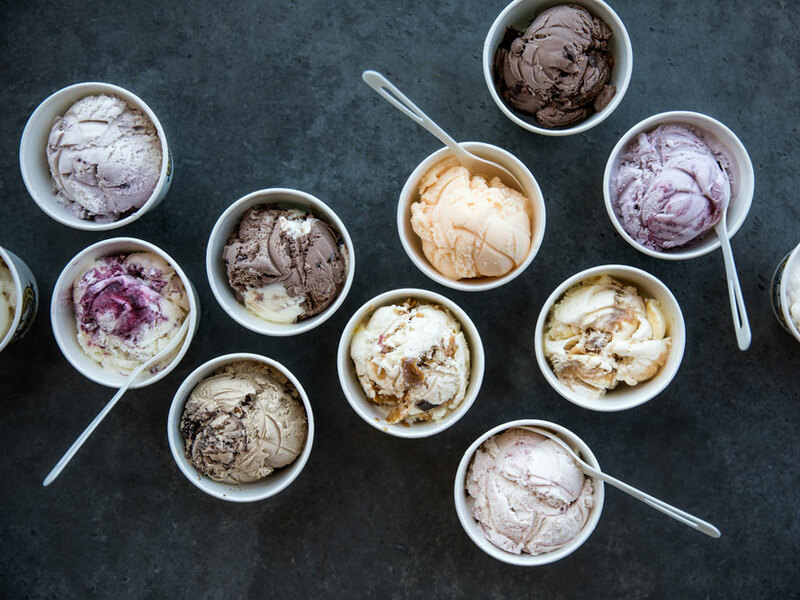 I'm not much of a pot person—I adhere to the old-fashioned American value of eating my way through the stress, an activity that requires no middle man—but I will admit to arriving at the creamery, out there on the Oregon Coast, a little over an hour from Portland, just a tiny bit delirious. Something about a five-mile hike out along the Pacific Ocean, during which there was rain, fog, mud, dust, blinding sunlight, a change in temperature of about thirty degrees, not nearly enough water, and no snacks; I'm telling you, that cow was looking right at me, and frankly, it looked kind of mad. Let's suppose you are the sort of person that gets paranoid after a hit or two—this thing, no joke, could have you running in the opposite direction, never mind the fact that it is only an extremely lifelike painting or photo of a cow, appearing to be gunning straight for everyone trying to walk into the building. The whole idea is echt-Pacific Northwest, gloriously standoffish, like, are you sure you're in the right place? Did you mean to stop here? Because, you know, California is only a few hundred miles in that direction. You might be more comfortable there. No, you do mean to stop, as it happens. A highlight of the otherwise relatively humdrum farming town of Tillamook, just over the coastal mountains from the big city, the creamery has been a top stop on the Oregon Coast for generations now, but then they went ahead and got fancy, building a nearly 40,000 square foot factory and visitor's center, all weathered wood and glass and light, and on the day I showed up with some Portland-based pals—trying not to make eye contact with the cow, mind—you'd have bet there were at least 40,000 people waiting in line, make that two lines, for ice cream. I've whisked through customs in foreign airports faster than these people were getting their Oregon Hazelnut and Salted Caramel ice creams; upstairs, there was a line at least 20 minutes long, of people waiting to get in and sample some cheese. There's a reason all of these people are here—any West Coaster in your life can tell you that Tillamook isn't just any dairy; anybody who has spent lots of time shopping in West Coast supermarkets knows that this is one of the most iconic dairy brands west of the Rockies, and for good reason. Founded in 1909 as the Tillamook Dairy Creamery Association, the farmer-owned co-operative dairy has long been ahead of the curve, doing things correctly because that's the best way to do them, not because American consumers suddenly woke up and realized that happy cows produce better milk. Their branding is unmistakable—the Tillamook name calls out to shoppers on the browse, whether they are looking for cheese, ice cream, yogurt, butter or yogurt. While West Coast grocers will typically have the most extensive selection, you can find Tillamook product as far away as the East Coast, and even in places like Walmart. Not that you have to have much familiarity at all with the Tillamook culture to appreciate your visit to this shiny palace by the highway, easily now one of the best looking buildings in a town not exactly known for its curb appeal, unless you are talking about the ocean, just a few minutes away. You just have to like cheese, and you just have to be making the drive up Oregon's Coast, which is one of the best drives in North America that most people live too far away from, which possibly helps explain why it remains one of the best drives in America, from Astoria all the way down to Brookings. The things you will find here at Tillamook today are roughly similar to the things you have long been able to find here—interactive exhibits, glimpses of cheese being made on the don't-call-it-a-factory floor, lunch, snacks, things with the Tillamook logo emblazoned upon them, and ice cream, of course. Today, however, the whole thing has been cranked up to 10, maybe 11 or 12—today, coming here feels like a trip to some sort of dairy theme park. An upper concourse—this really does feel like an airport, but in a nice way, promise—features kid-friendly exhibits, and views down to the immaculate and impressive factory floor, along with an explanation of what you're looking at. Off to the side, there is that entire hall dedicated to cheese tasting, with lots of room for people to line up. An army of cheese cutters hacks away at blocks of cheddar—they've got all kinds, from medium up to three-year-aged extra sharp—or Jack or Swiss or Colby. 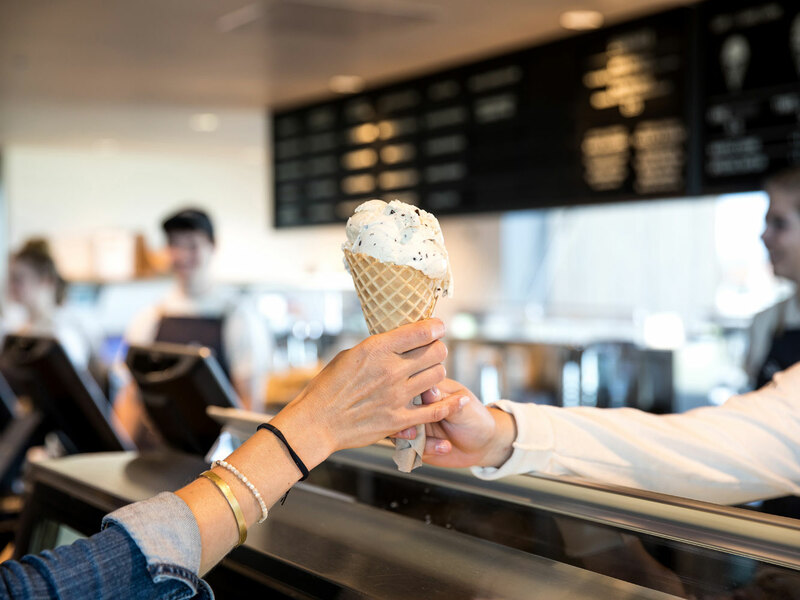 Happily, you do not necessarily have to wait in line forever for a snack; downstairs, there's an entire food hall now, with a menu put together by Portland chef Sarah Schafer (Irving Street Kitchen), celebrating the twin pillars of Tillamook life—cheese, and the ocean. You can have gently fried Pacific oysters, served with a drawn Tillamook butter dip, and there is a razor clam pizza, a nice white pie with a garlic and lemon sauce, topped off with parsley, chili and a drizzle of extra virgin olive oil. As a starter, you can get a salad of Oregon bay shrimp, tossed with bibb lettuce and roasted cherry tomatoes, served with a house sour cream and herb dressing. 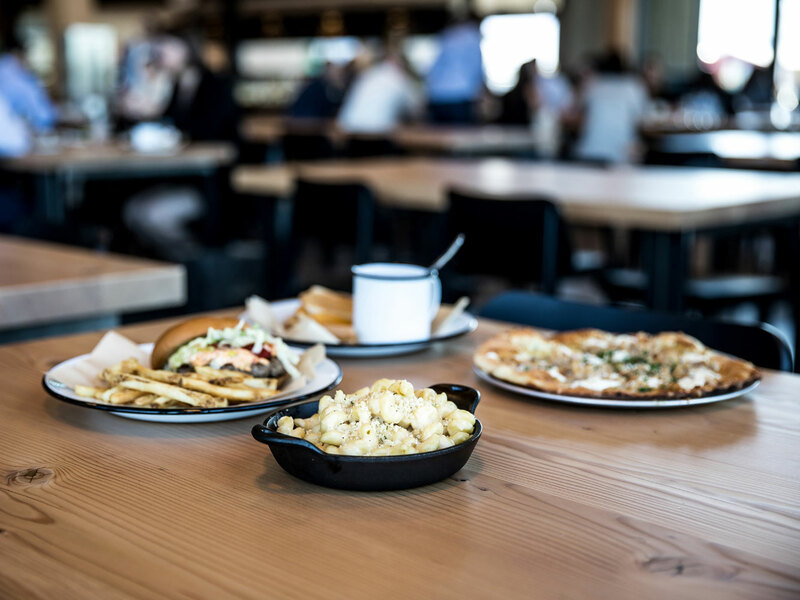 Just in case all of this is a little high end for you, no fear—there's a burger, too, there are a few of them, one with housemade pimento cheese, which they really ought to start selling in supermarkets. There is a Croque Madame with the house Colby Jack and Olympia Provisions ham, and of course there are fried cheese curds, as well. To the side, there is a coffee bar serving up stiff drinks made with Five Rivers beans, roasted just across the street; there you can make your own yogurt parfait, but even on a supremely busy day, when you could barely get in the door, nobody was doing that, and why would they—not when there are dozens of flavors of ice cream being scooped, just steps away. The whole experience is lively and fun and pleasantly low-key, considering how many people had decided to descend upon the place, on the day of my visit; anyone making the trek that afternoon to specifically try the ice cream was probably not disappointed, considering the vast array of offerings. The average grocer's freezer in these parts will offer a healthy selection of Tillamook flavors, but nothing like you will find at the source—Mountain Huckleberry, Salted Butterscotch, Oregon Dark Cherry, Fireside S'mores, plus a rotating selection of special, creamery-only flavors, not to mention designer sundaes with of-the-moment topping combinations like olive oil and sea salt. Me, I couldn't be bothered to wait in line, I was really just in it for the snacks. Promising myself I'd come back on a quiet Tuesday in, say, the dead of winter, where there would be no impatient Northwest parents behind me in the ice cream line, tsk-ing at me while I took forever to make up my mind, I ducked into the vast factory store, which not only had pretty much every Tillamook product ever created (not to mention some incredibly good-looking Tillamook merch, thanks to a recent brand makeover), there were also other regional food favorites, like Jacobsen Sea Salt (hand-harvested just a few miles away, at Netarts), and Olympia Provisions meats. The market was just as much of a zoo as the rest of the complex, but at least the line moved quickly, and within minutes, I was back out in the glorious summer sunshine, scarfing down salted caramel ice cream sandwiches, saucisson, and aged white cheddar, under the watchful eye of the giant cow, and an abundance of blue sky. No doubt I could have gone higher, if I'd wanted, but right then, I had everything I needed.